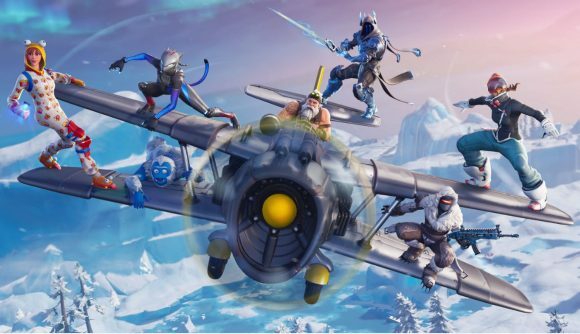 Besides all the top line content coming in the next Fortnite update, Epic is also making an array of notable balance changes to the battle royale. Those include a broad set of nerfs for some of the game’s most controversial items, as well as a interact button for ziplines and more measures to make them safer to interact with. Planes can longer smash through structures as of the 7.40 update. Hand cannon damage will be reduced from 150 to 100. Reload time for RPGs is increasing from 2.52 seconds to 3.24 seconds, and that applies across all rarities – additionally, rocket launchers will no longer spawn from chests, but will be slightly more common in supply drops. Ziplines now have an interact prompt, and you’ve now got fall damage immunity from them. The Turbo Build delay is dropping from 0.15 seconds to 0.05 seconds, and you can now crouch while in edit mode. Epic’s Reddit post notes that these are just “some of the changes” coming in the next patch, so it looks like more will come in the full patch notes. In the meantime, it looks like the Fortnite community is saying some unusual thank yous in the wake of these changes, some of which have been a long time coming. Some players are attributing the update to the rocketing player count of Apex Legends, suggesting that this success is pushing Epic toward more substantial improvements for Fortnite. For my money, it seems unlikely that a single week of Apex Legends is enough for Epic to bring together such a broad set of balance changes. Still, further competition for the mega-hit battle royale is a good thing for all involved. We expect the 7.40 update to hit tomorrow with the crossbow and the Share the Love event’s overtime challenges. We’ll see what other changes are coming to the game when the patch notes hit alongside everything that’s coming with this particular update.